Iba Talaga ang Nagagawa ng Pamahalaang Seryoso at May Kamay na Bakal sa pag papatupad! According to the Bureau of Customs-Financial Service (BoC-FS), it was the second time after September that the agency exceeded its monthly target since BoC Commissioner Isidro Lapena took over the office. The BoC records also indicates that this achievement is so far the “the highest monthly collection in the agency’s history,”. Customs is targeting to meet its 2017 assigned collection goal of P468 billion, currently, the BoC is still P124 billion away. Based on BoC’s historical data, the collected amount in October surpassed the earlier posted collection of P40.182 billion in September. 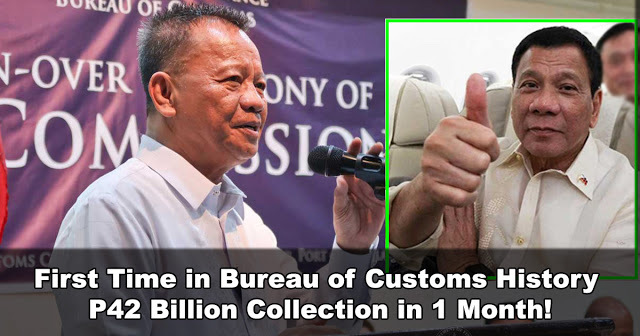 Reportedly, the Customs average monthly collection reaches to only P35 billion, which was prior to new commissioner’s assumption to post. “Although the month of October was marked with [a fewer]number of working days and volume of imports, growth was still achieved because of increase in the value of imports brought by the higher exchange rate, oil price and improved valuation and classification,” Lapena said. “Slowly, the reforms we have started are gaining ground,” Lapeña added. According to reports, BoC has seven-year collection slump, which started sometime in 2010 or during the Aquino term which made the agency change its leader for four times. Moreover, Lapena is confident that the customs will reach its target for 2017 despite the challenges and roadblocks. “Our latest revenue performance only shows that if we work together, nothing is impossible,” he said. Lapena prioritized to discontinue the benchmarking of duties and taxes and also to strictly follow to the World Trade Organization (WTO) Valuation Codes and classification of goods. The BoC chief also ordered the employees in the bureau as well as the stakeholders not to get involved with tara or grease money.